A few weeks a go Teddy didn’t come in for his breakfast, which was a little bit odd, as Teddy LOVES his breakfast! All my other cats were there waiting, but Teddy’s place remained empty. I called him for several minutes but he still didn’t turn up and then I had to go to work. There were a couple of things worrying me. One, it’s a relatively new area and my cats have moved in to a new big ginger tom’s territory. The other thing that was worrying me slightly was that it was so hot that I thought if he was trapped in a shed without water he wouldn’t last very long. 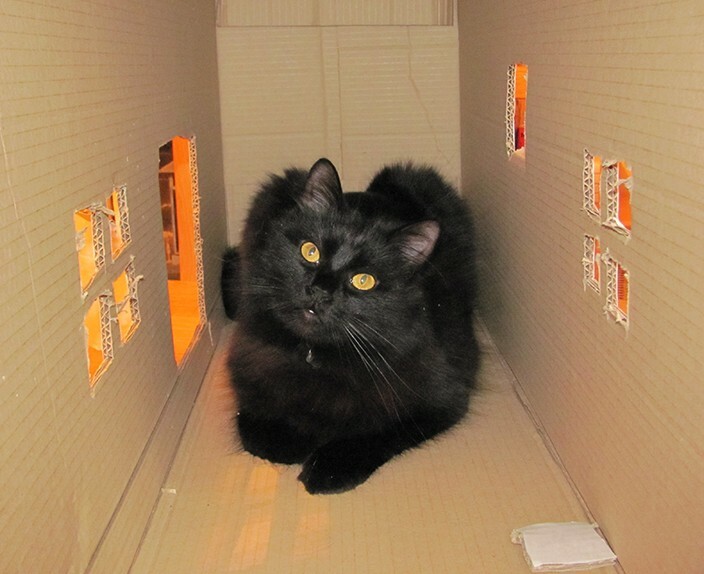 The next morning when Teddy was still missing, my wife and I made some missing posters with the photo below and took them up and down the street asking them if they had seen a black cat. We were delighted to find out that our neighbours were really friendly and all checked their sheds to make sure Teddy wasn’t trapped inside. As it got hotter and hotter I started to worry more and more. So, by the Friday, I was at my wits’ end and decided to take the day off and try to find him. I started to walk around the farmer’s fields at the back of my house. I had never seen Teddy go over there, but I had searched everywhere else and thought it’s the only place left to try. I started to look in the hedgerows, calling his name and whistling. I searched one field expecting any minute to be shouted at by an angry farmer. Then I found a gap in a hedge and decided to search one more field. At this point I almost turned back because I thought Teddy would never have gone this far! But there was something inside that pushed me on that extra little bit. So after I clawed my way through this hedge, I found myself in a wild unkempt field full of fox and badger pathways in the long grass. I started to look along a hedge that bordered a road thinking that if a car had hit him I might find Teddy in the hedge. So I walked along, whistling and calling but by this time I had started to give up hope. I crossed the fence and started to walk down the road, calling in to the hedge from the other side and to my absolute amazement heard a very faint “mew” I recognised instantly! I started to search around, in the hawthorn hedge even now expecting to find Teddy injured but no matter how deep I went in to the hedge I couldn’t find him. It was only then that I realised the mewing was coming from high above. Even though I could hear him, I couldn’t see him. Teddy wasn’t in the hedge but about 14 feet up a tree. I went back around the hedge and there on a branch sat Teddy. I could see straight away that he had been injured on his mouth but I could not reach him to get him down. He was very happy to see me and was chirping his head off! I ran back home and grabbed a ladder from my garage. 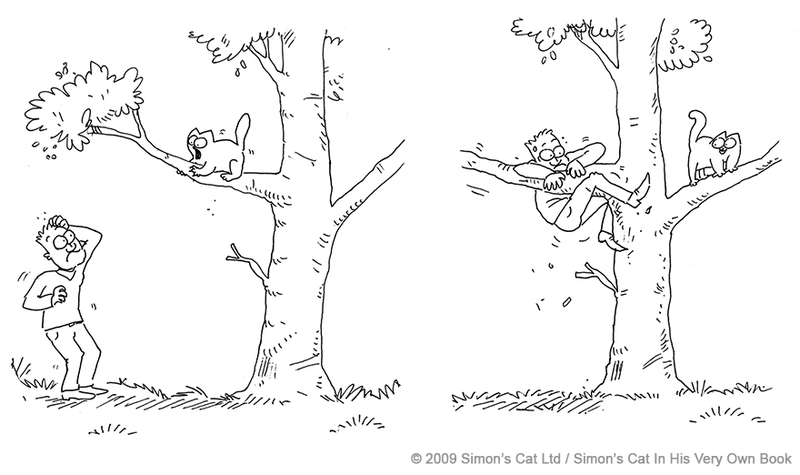 However, Teddy was too far up the tree for the ladder to reach. After many attempts to call him down had failed, I decided the only way to get him was climb in to the tree myself. So I jumped off the ladder and started to pull myself up the tree hoping that the dead branches didn’t break under my weight. After a little bit of climbing I finally reached a place that I could sit on a branch and reach Teddy. Teddy at this point was over the moon and I don’t think he’s ever been more glad to see me. I quickly checked him over and found that it was just his mouth that had been injured. At this point I made a gap in the foliage and dropped him down into the long grass. He sat there for a bit, still mewing and then looked back at me with a startled look on his face. 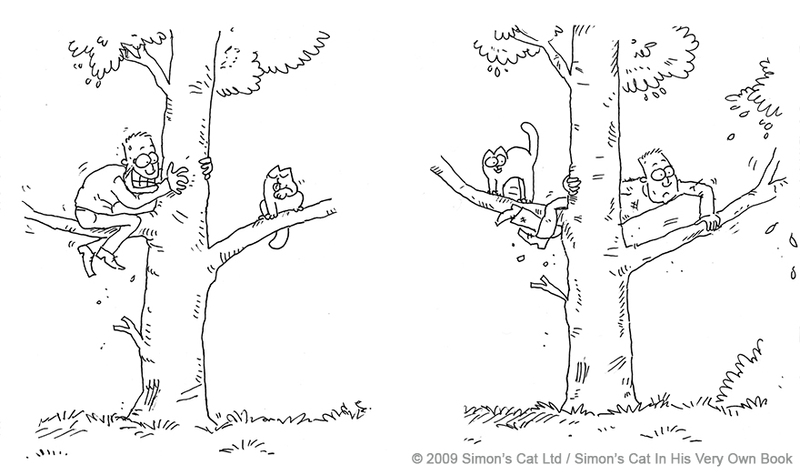 It was around then that I realised that I was the one who was now stuck in the tree! I couldn’t see the ladder anymore and was surrounded by a thick hawthorn hedge, 14 feet up an old tree. I didn’t like the idea of jumping down, so decided to swing down and try and find the ladder again with my feet. This I managed to do but got badly scratched in the process. When I finally got down to the ground Teddy was so tired from his ordeal that he let me pick him up and carry him all the way home without struggling. I still can’t believe I actually found him all that distance away and I’m so glad that I pushed myself to carry on looking that extra field. When we got home I took him off to the vet, who gave him a good checking over. He had a badly cut mouth and tongue, from his run in with the big ginger tom I’m guessing, but apart from that he was absolutely fine. And is now back to his naughty, cheeky self! 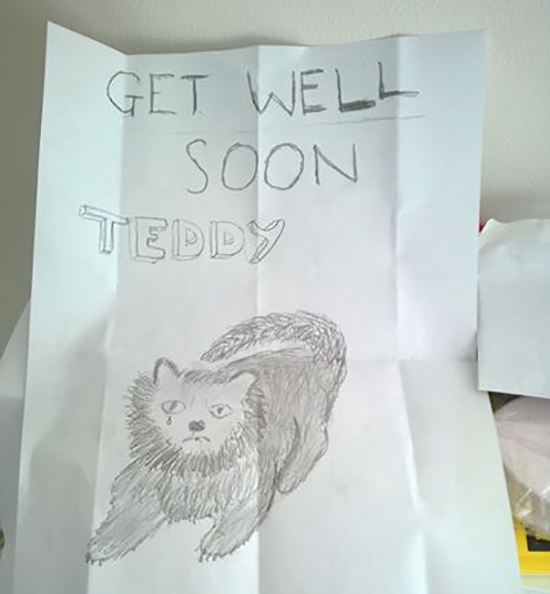 After he was safe and sound at home I took another poster around the houses letting everyone know Teddy was okay and was touched to find this picture had been put through my letter box the next day by a little boy up the road. He had drawn Teddy from the photo. 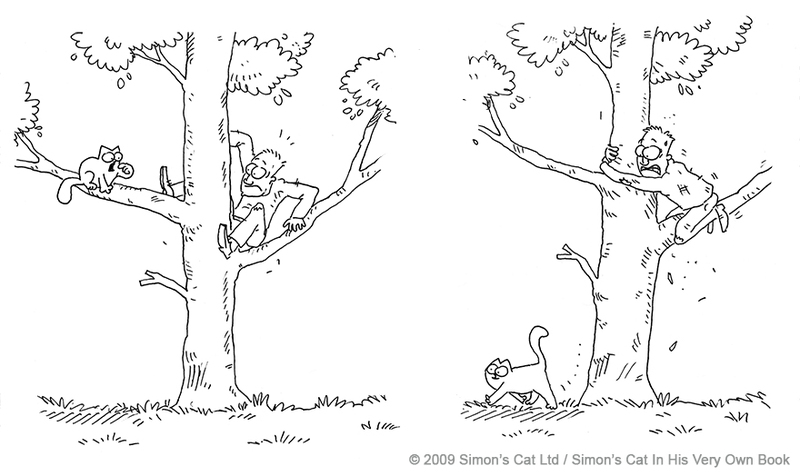 When I was stuck in the tree, I couldn’t believe that I had drawn this exact story five years earlier and had to laugh to myself. I base most of my storylines and gags on real life cat observations, but this one came the other way round with me sketching it first and then it happening for real. That’s true life imitating art!